Awwww, isn't he cute? I went by to drop off a Valentine's Day card for Mom and Dad (a first, but I found a card for both parents and thought it would be a nice surprise), and there was this fella floating above. I have two wonderful parents. I appreciate the fact that Dad thinks of Mom on Valentine's Day. I'm not a huge fan of the holiday, but I've come to recognize that it means a lot to my wife, and so I try to do something for her. I imagine that my Mom really appreciates that Dad does something for her. While working at "Mr. Barbecue and Stuff" at the mall, there was an older couple who would often walk around the mall together. The would always hold hands. We were right by the bathrooms, and he would wait patiently while his wife was in the ladies room. While I was working one Valentine's Day, I asked him what he and his wife were doing for the occasion. He told me that "Valentine's Day is for young people". It was obvious that he and his wife were very much in love. 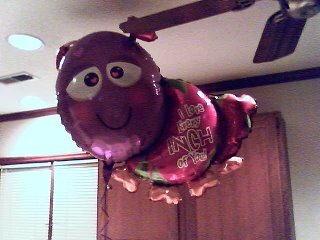 What about that balloon says "LOVE"? That thing says, "I'll bug you!"